Was Drake's Grammys Speech Cut Off for Criticizing the Grammys? Drake has had a long and complicated relationship with the Grammys, and it only got weirder last night (February 10). The Toronto rapper took home the trophy for Best Rap Song, and surprisingly actually showed up at the ceremony to accept the award. His acceptance speech didn't paint the Grammys in a particularly positive light, though. Drake seemed to declare the irrelevance of awards like the one he was holding, addressing kids and up-and-coming artists. He told them to recognize that "we play in an opinion-based sport, not a factual-based sport." "It is not the NBA… This is a business where sometimes it is up to a bunch of people that might not understand what a mixed race kid from Canada has to say, or a brother from Houston right there, my brother Travis [Scott]," he continued. "You've already won if you have people who are singing your songs word for word, if you are a hero in your hometown. If there is people who have regular jobs who are coming out in the rain, in the snow, spending their hard-earned money to buy tickets to come to your shows, you don't need this right here. I promise you, you already won." Drake seemed to continue, saying "but" before his mic was cut and the broadcast went to commercials, leading many to believe that it was an intentional speech-ending move by the show's producers. Twitter got pretty up in arms over the perceived slight. Grammys cut Drake speech cuz he was shitting on them in the most polite way. A representative for the Grammys, however, later told Variety that producers were not punishing Drake, but merely thought that he had finished his speech. "The producers did speak with Drake following his speech and did offer him to come back on stage to finish whatever his thoughts were," Michael Samonte told Variety. "But Drake said he was happy with what he said and didn't have anything to add." 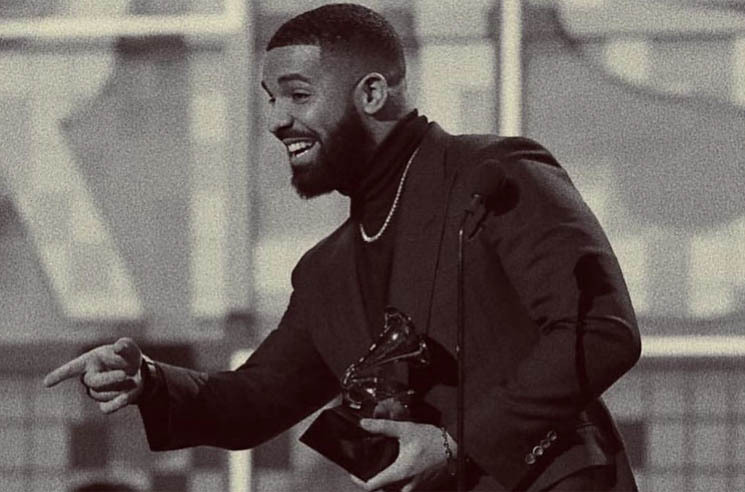 Drake seemingly alluded to the controversy later in the night, posting a photo of his winning envelope with the caption "Too raw for TV" with a crying laughing emoji. Drake's strained relationship with the Grammys goes back years. He has been nominated for 42 awards since 2010, taking home just four (including last night's win). Drake's previously won Grammy Awards were famously used as shot glasses, and he's made numerous less-than-flattering mentions of the awards show in his lyrics. On his verse on Big Sean's "Blessings," he rapped, "I could give two fucks about where the Grammys go," while VIEWS cut "Grammys" poked fun at the fact that Drake had only one Grammy to his name at that point and Future had none. It's not the only awards show Drake has beef with, though. He once again didn't submit to this year's Junos in his home country of Canada, which many attribute to previous snubs in the categories he's been nominated in — including the year he hosted and went zero for six. Watch Drake's Grammys acceptance speech below.